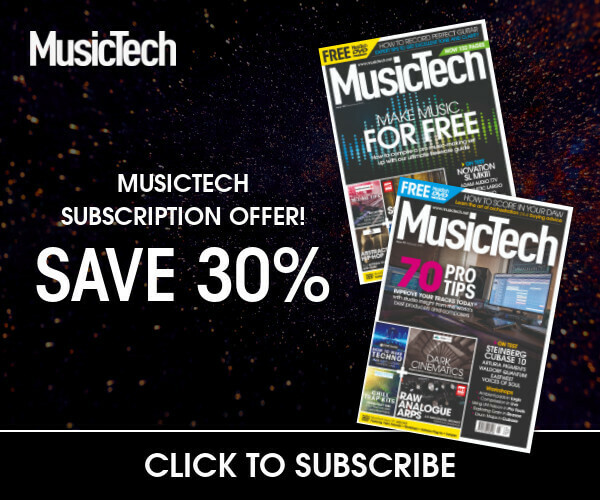 I’ll let fellow MusicTech reviewer John Pickford take the credit for noting a recent seismic and historical shift in studio-monitor quality. 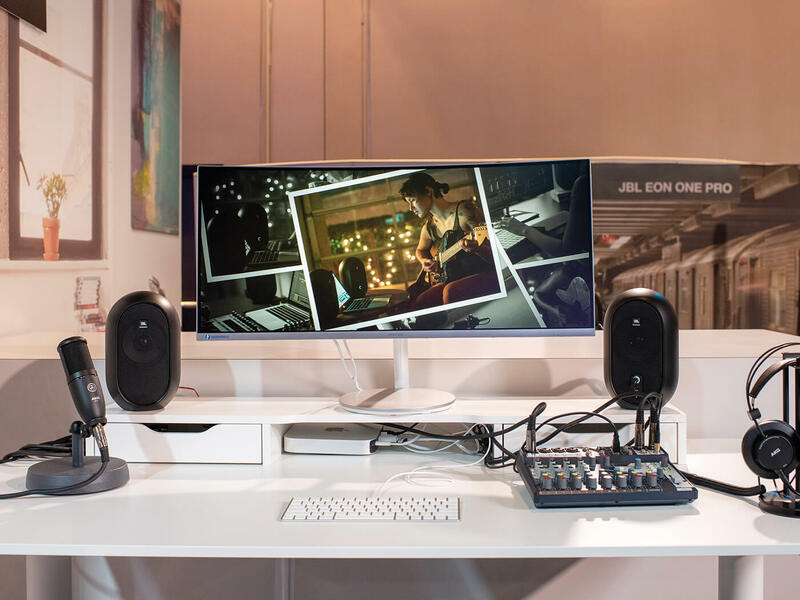 Our advice used to be to pay £1,000 or more for decent monitors, but recently, John noted that: “Advances in transducer technology, cabinet design, and on-board amplifiers have improved the performance of more affordable monitors beyond all expectations”. That, you might think, was a reasonably throwaway statement, but Pickford knows his stuff – I mean really knows his stuff. So much so that we usually give him the really expensive monitors to review at his Invada Studios – the prime place to line them up against other just-as-expensive options. With ears like his, he can also tell if four figure speakers really are worth the extra cash, for what can sometimes be just a fraction of a percent in terms of quality. But his statement above came from reviewing a set of £388 JBLs 306P MKIIs. And that simple, single sentence, of no more than 23 words, marked a momentous moment in both the history of studio monitoring and of MusicTech advice. 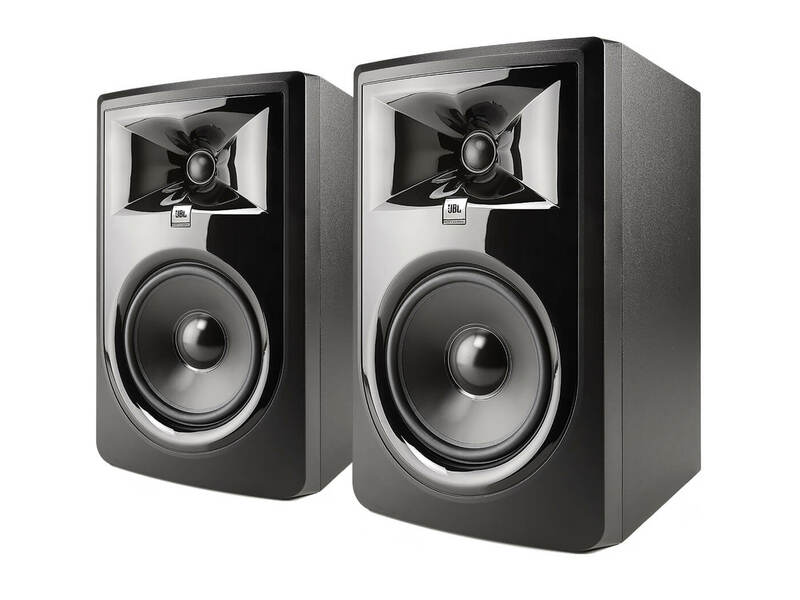 For years, we’ve been saying you should spend four figures on decent studio monitors. Now, you can get decent monitors for less than 500 sheets. Praise be, let the doves fly, set the geese loose (eh?). Those JBLs were pretty compact at 361 x 224 x 282mm, but these new Series One 104s are even smaller, so the question is: can they maintain the new ’cheap is good’ philosophy carved out by their (not that much) bigger brothers? For once, I’m one step ahead of Pickford in the small studio-monitor stakes. I’ve already had at least one ’how can they do it for that size?’ monitor moment with the IK iLoud Micros, a couple of years back. So good are they that I couldn’t quite believe my ears, but they garnered great reviews all round. So that experience, and John’s words on the 306Ps, have got me pretty excited about these new JBLs. The Series One 104s boast a coaxial design which means the HF driver is slap-bang in the middle of the LF one, with both then able to deliver their wares from the same axis and at the same time to the listener. This apparently offers a truer response and a wider sweet spot, although I’m not sure why I say ‘apparently’, as my experience with coaxials extends to both Genelec (expensive) and Pioneer (quite expensive) models, both of which certainly delivered some fantastic goods on both points with their coaxial setups. 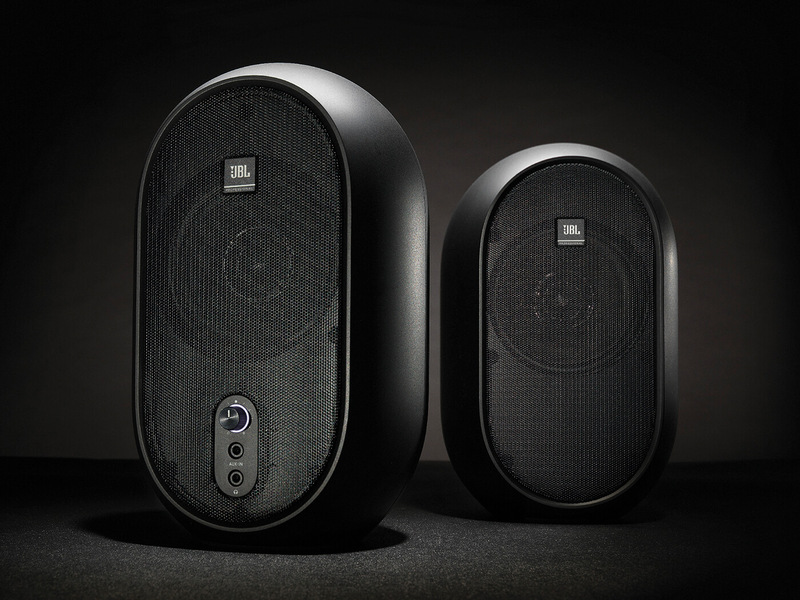 And it’s both detail and honesty that JBL has clearly planned to deliver when designing these speakers, with a mission to ‘provide the most accurate sonic presentation of any monitors in their class’. They are also acoustically optimised for desktop use and feature enough inputs to plug signals in, from devices from both pro audio and entertainment arenas – game players being another key target audience for JBL. (I will, of course, attempt to test this aspect of the speakers, just for you, dear readers. Wipeout Omega Collection here I come…). The speakers are set up with one as a Master unit – with the amplifier gubbins inside, so it’s heavier – which you connect to the other with a red/black wire. 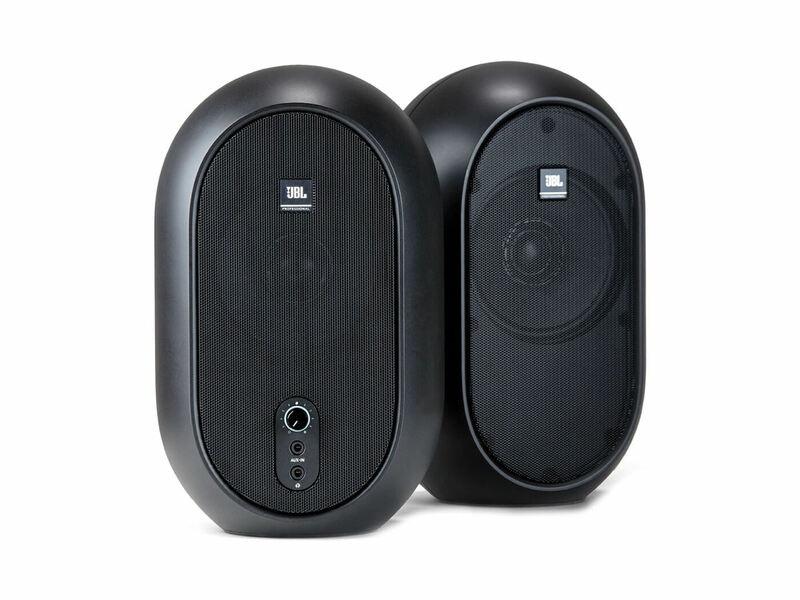 These are rounded speakers, with curved sides and flat bottoms. The sloped sides (from back to front) mean you can’t position them on their side, usually an option with coaxial monitors, and nor can you angle them on your desktop so that they point upwards, so you might need stands to get them at the correct listening height. They are very well built, though, with a very solid enclosure, and rubber bases offering some isolation from vibration. Around the back you get both standard 1/4 inch (6.5mm) ‘pro’ inputs and 3.5mm inputs for ‘phones, laptops, and mp3 players. There’s little else in the way of controls (a good thing perhaps) with no EQ shelving around the back and just a headphone socket and volume rotary around the front of the Master speaker. I start my tests lining them straight up against my three-way reference monitors that cost 15 times the price. Well, why not? ‘Because it’s unfair,’ I hear you reply, but the clue is in the word ‘reference’, as I know these speakers well, so they will draw out the JBL truth in any comparisons. But really, that truth is something that, initially anyway, I don’t want to hear. I’ve either seriously overpaid for my reference speakers, or these JBLs are the bargains of the year. I have both speakers set up with my Audient interface as main and aux outs and then set up two different mixes on the interface so that they can be easily switched between, making sure volume levels are suitably equal (and I do need to crank the JBLs up a little). The initial listening tests reveal the JBLs handling themselves well, scrapping like a young, ripped David against a slightly arrogant Goliath. Bass response is right up there, big, powerful and bouncy and reverbs – always a good test for detail – come through very clearly against some more complex parts of the mix. Detail is definitely there – something that is more evident when I move away from my own music mixes, onto my usual list of listening-test favourites. The range shines through, but some of these better-mixed tracks also start to reveal some inadequacies in the mids, with less impact on some string and pad sounds when I move from more acoustic to electronic dance material. I am comparing three-way with two-way speakers, remember, and of vastly different prices, so this is to be expected. What isn’t expected is that the difference between the two that I’ve just described, even over this part of the frequency range, is not as pronounced as the price suggests. Nor is the bass as coloured or as emphasised as I expected it to be on speakers this size. Back in the day, speakers like this would require more colouration down below than an Etch A Sketch pad or at least a separate subwoofer, but JBL’s designers have done an excellent job delivering punch and tightness that only falls down slightly when I throw some of my ridiculously over-bassed (is that even an expression?) tunes at them. Overall then, the JBL One Series 104s stand up incredibly well, given price and size. I almost feel bad to criticise them as they most definitely fulfil that brief of delivering a best-in-class performance – certainly, you won’t find anything at this price point that gets close. The inability to adjust the desktop angle does seem like a missed opportunity, though, and doesn’t afford the positional flexibility I’d like. 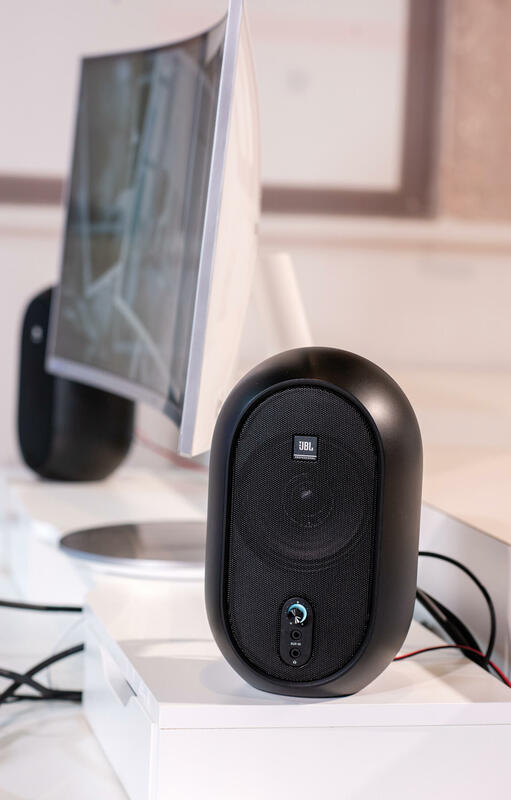 However, you could easily invest in custom-angled stands from the likes of Iso Acoustics with the cash you’re saving – in fact, I’d recommend it, as they will give you both better speaker isolation from your desktop surface and a custom listening angle. As to whether I’d solely monitor on these, that is the most difficult question. I have reference monitors that I know and love, so you’re probably asking the wrong person. But as secondary monitors, most definitely, and if it was me buying monitors 20 years ago, then there’s no question. So if you are strapped for cash or space, then I simply have to recommend them. These are about as good as it gets for the price and, size wise, there’s simply nothing else out there that beats them. Mr Pickford was right, monitoring history is being made, and we’re all the better off for it. My first experience with good and smaller monitors and they actually seem a bit pricey now, but you can shop around for slightly better deals, and they really do pack a quality punch given their diminutive size. I’m going with Mr Pickford as a bit more cash gets you a bigger set of JBLs, arguably more suited towards the business end of monitoring, and even great as sole monitors. As he says: ’the sub £500 market is thriving’. 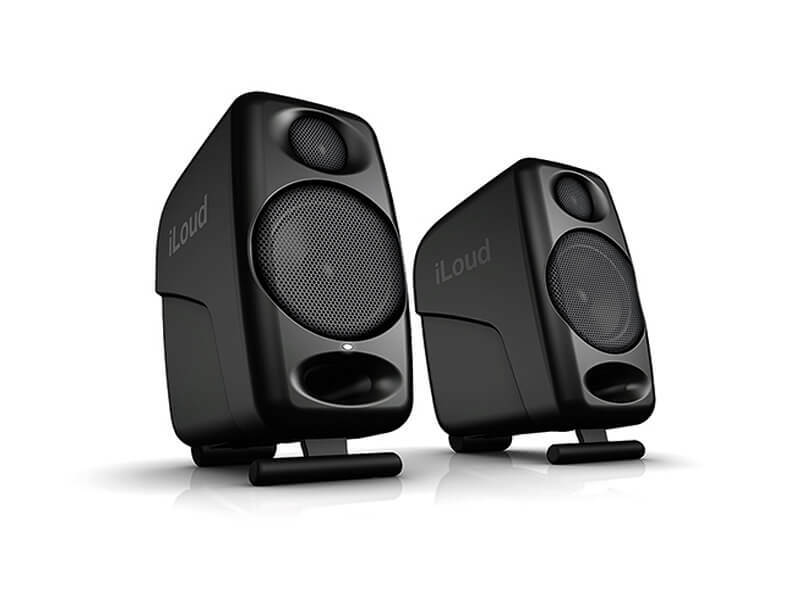 Fantastic desktop speakers, with a sound quality and clarity that is a match for models many times their price (and size).